Scottish Curling has overturned its decision to send Eve Muirhead's rink to the World Championships, with the team led by Sophie Jackson now heading to the tournament in Denmark next month. 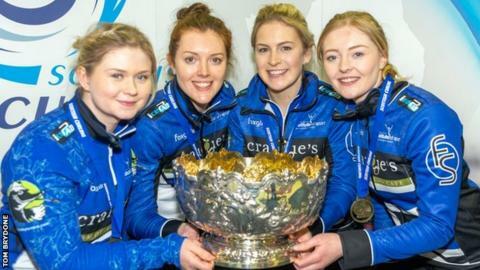 Jackson's rink won the Scottish Championships, beating Team Muirhead in Saturday's final. However, Team Jackson had committed to an event in Russia that ends four days before the World Championships. "We wish Team Jackson the very best of luck," said Scottish Curling. "We are in no doubt that they will be exceptional ambassadors for Scottish Curling. "Team Jackson sought a review of the situation regarding their representation at the World Championships. This has been a complex issue to resolve and we did not want to rush the judgement. The Scottish Curling board has supported Team Jackson and found in favour of Rule C.12(b) "The winning team shall represent Scotland in the world curling championship", which supersedes all other considerations. "Team Jackson had previously committed to represent Great Britain at the World University Games (WUGS) as their priority goal for the season and this gave a challenge regarding preparation for playing at the World Championship."